Last night, CNN’s “Lou Dobbs Tonight” aired a segment criticizing the National Council of La Raza (NCLR) and the Mexican American Legal Defense and Education Fund (MALDEF) for holding a news conference earlier in the day calling attention to the link between anti-immigrant rhetoric and hate crimes against Latinos. The groups were reacting to the recent murder of Marcello Lucero, an Ecuadorian immigrant, who was fatally attacked in early November by seven high school students in Suffolk County, New York. “Suffolk County is a particularly good example of elected officials stoking the fires of anti-immigrant sentiment,” NCLR head Janet Murguia said during the press conference. She spotlighted the anti-immigrant rhetoric of Suffolk County Executive Steve Levy, saying he had been “notably hard line against immigrants in his county.” Earlier, Levy stated that the Lucero murder would have been a “one-day story” if the media hadn’t chosen to hype it. Levy later apologized for the remark. Dobbs, who has a long track record of defaming immigrants by linking them to crime, disease and other horrors, would probably like to pretend that immigrant bashing doesn’t lead to hate crimes. But the facts of the Lucero case show otherwise. The teens implicated in Lucero’s murder specifically declared that they were going to “go jump a Mexican” and went out hunting in the ethnically diverse village of Patchogue. Latinos in Suffolk County have long reported being threatened and physically harassed and there have been other highly publicized attacks there, including the near-beating death of two Mexican day laborers in 2001 and the burning of a Mexican family’s house in 2003. 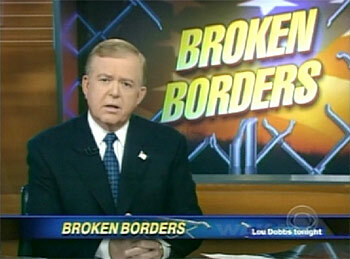 Dobbs also took issue with the idea that hate crimes targeting Latinos are a problem. Dobbs’ report cited the FBI’s annual hate crimes statistics to make the point that hate crimes nationwide had dropped from about 7,700 in 2006 to 7,600 in 2007. Dobbs claimed that hate crimes in Suffolk County had declined under Levy. But it is widely known that the FBI’s numbers severely undercount the extent of hate crimes in America. In fact, according to a 2005 Department of Justice study, there actually are about 191,000 per year—nearly 30 times the FBI’s numbers. Most hate crimes are not reported to police and many jurisdictions do not participate in the FBI’s voluntary hate crime reporting system. Hate crimes against undocumented immigrants are particularly underreported, because of an understandable reluctance to contact state officials. And as limited as the FBI figures are, they show that hate crimes against Latinos are on the rise, having gone up by 40% since 2003. Dobbs left out that fact . By diminishing the importance of hate crimes, Dobbs ignored the unique threat these crimes pose. The terroristic effect of hate crime creates fear and distrust along already fragile intergroup lines in a way that other crimes do not. When a black man is dragged to his death in Jasper, Texas, it instills terror in the entire black community.